I'm sorry, but I don't have any information on the death of this Falcon. If you could provide some details, please contact Kay Weaver. The Johnson High alumni will miss our teacher Mr. Pierce very much. 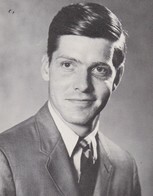 Faculty member John Pierce died of injuries sustained in a motorcycle accident while teaching at Johnson High School in 1967.